Anorexia and bulimia are two common eating disorders that affect mostly young females. Both are extreme eating behaviors and not just ways to lose weight. Some may have started out for that reason but it spirals out of control. Knowing what the warning signs of anorexia and bulimia are can help stop these devastating disorders. 40% of newly reported cases of anorexia are in girls 15-19 years old. Many anorexics come from educated, middle-class families and strive to succeed, including having the perfect body. They have an extreme fear of weight gain and a distorted view of their body. They see themselves as fat despite being grossly underweight. Anorexics restrict their food intake significantly and usually exercise excessively to burn calories. They go to such an extreme that they become severely undernourished; finally achieving a body weight of 70 pounds or less. Anorexia means "lack of appetite"; however, anorexics do not lose the urge to eat. In fact, images of favorite foods may haunt them constantly. Control is a key issue for the person with anorexia. Bulimia affects mostly young females in their teens and early 20s. Most bulimics are brighter than usual and are at their ideal weight. Bulimia is a disorder characterized by episodes of secretive bingeing (excessive eating) followed by purging (self-induced vomiting) or by using laxatives or enemas. Most bulimics realize their behavior is abnormal but they are too embarrassed to seek help. The foods chosen for binges vary, but typically they are "forbidden" sweets or starches. Severe bulimics can have as many as ten binges a day, up to 5,000 calories each. Bulimics may be able to hide their condition inside a relatively normal looking body, but the anorexic will eventually become a wasted skeleton if not treated. The earlier the warning signs of anorexia and bulimia are discovered, the better the chances are of being treated successfully. 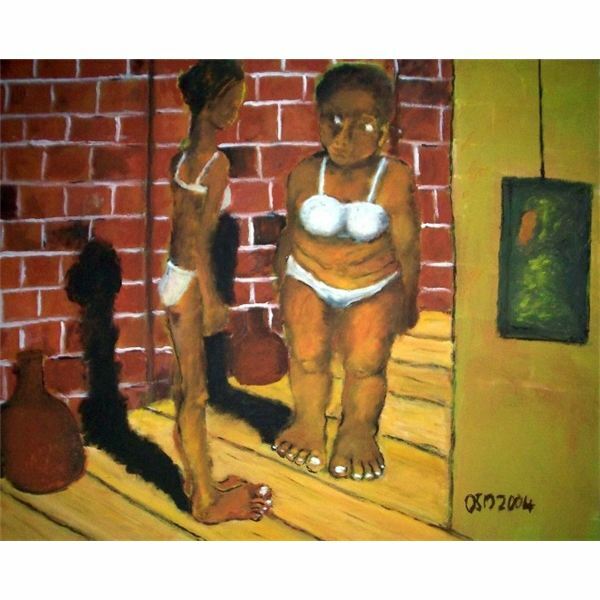 Image courtesy of Dr Mohamed Osman, Physician & Artist (image in the public domain).